Ok, so we all know what it’s like to perfume shop. The WORST. The salespeople are pushy. You don’t exactly know what you want. Everything is expensive. To say the process is annoying is an absolute understatement. But I have found the easiest and most enjoyable way to shop for perfume-and you make it to fit exactly what you want. I was invited by Susan over at Deco Scent Lab for a perfume making workshop and ladies-I had the time of my life! I was there was there with 5 other fantastic women I had never met before, and we seriously had such a blast making a scent that was unique to each one of us. Before this workshop, I had never heard of such a thing-but now I am in love! I want to walk you through the process and by the end, I guarantee you will want to make your own personalized bottle of perfume as well! Susan Verekar runs Deco Scent Lab and is a transplant here from Oregon! (What a trip!) She is oh so lovely–I’m not kidding dolls-Sweet as sugar! On a trip to Paris, she wanted something fun to do and took a perfume making class-she instantly fell in love. After her experience with a master perfumer, she wanted everyone else to have a chance to make their own signature scent-and look! Here we are! So here is how it works–there are over 100 perfume oils to choose from (overwhelming? You would think so, but not even close) and Susan helps walk you through which ones to start with. Is there a certain perfume you love and would like to try to recreate? She can do that! Do you know there is a certain smell (Like vetiver, coconut, apple, pine) you like, but not sure how to make a suitable scent? She can help with that! So you create 3 different scents based on the oils you like, and out of those 3, you choose 1 scent to make a large bottle of! It’s so simple and did I mention–the champagne?? We had drinks and laughs nonstop. Again-I happened to be with women I had never met in my life and had that much fun-now imagine how much of a party it would be if you were there with your #girlsquad. Your family. Your bridal party. Your workmates. Your hubby. Such a blast yall! OHHH and the fact that you could make a cologne for your hubbs that you are attracted to? How insanely intimate is that? Did you know that scents trigger memories more than any other of the 5 senses we have? So make a memory y’all! I am totally in love with this idea. It’s so much fun knowing you made your own signature scent ladies. And if you totally fall in love, don’t worry-You can recreate your scent later on. Susan keeps the formula so you can make/order another bottle! If you want to get a group up for a workshop, go see Susan at Decoscentlab.com. Now, y’all know how I love me a talented creator? Well Susan is just that. She designs some of the most beautiful handbags I’ve ever seen and now has this phenomenal business that brings so much joy to the everyone who meets her! Take her class and I promise you won’t be disappointed. Grab your besties. Grab your momma. Grab Granny and go make your own perfume! I obviously over-enjoyed myself at this little workshop and I want you all to experience the fun too! Schedule a workshop of your own here. It’s time for a shoutout. But this first child? He catches on to everything. He is smart-beyond smart and his little mind goes where other 5 years olds don’t always wander. Ford is always digging deeper into issues than we could ever even imagine he would go, and at the same time, we find him digging himself deeper into our hearts. He wants to understand death. He wants to know how our heart/brain keep us going. He wants to know how trains can wreck if they are always on tracks. (This one I loved) His wonderment blows us away. He has always had an interest in books and has loved me reading to him since since day 1! He was turning pages in books by himself since he was an infant ( Like hello Mom? You aren’t keeping up with me!) and talked early and clearly because of it! At 2 years old, Like we had just met and wanted to make sure it was the appropriate way to address me, he looked at me and said “Mom…….can I call you Mom?” What kid does that??? At 4 years old looks at me and says “Mom I have to pee.” So i give him the look of -you can do this yourself/no need to ask permission and say “Okaaaayyyy”. He pops his head up and says “It’s NOT OK. IT’S A DIFFICULT EMOTION.” I could have lost it. Not saying that is some genius kid comment (He obviously didn’t quite comprehend his sentence–I’m just saying-he was 4 years old. What 4 year old says things like that? And to top it off, his teacher thinks he is phenomenal and that means the world to us as parents. We had parent/teacher conferences last week, and she relieved us of any and every worry we have about him at school. I want to share all the sweet comments she said, but afraid she want’s to keep it confidential as not all kids may have had the greatest reviews. I will say this. She mentioned “I am a nice person, but I am also honest. I am here to talk about each child’s strengths, but I am also here to share the hard stuff with you parents…….And I have none of the hard stuff to say about Ford. He is truly a special child. He cares for everyone and is so good-hearted. I have taught for a long time, and every once in a while you will get one of those truly amazing kids-and Ford is one of them.” I swear there was light beaming from my head from the pride I experienced at that moment. And not even from the academic standpoint, (Which really, if you know me, this is SO IMPORTANT. ) But to know that he is good-hearted. That got us. We couldn’t help but smile when she said he was beyond smart, so helpful and cared about his fellow students. You feel like you are doing something right as a parents when your kids are praised like that. But lately, he is gaining independence. It’s beautiful and saddening at the same time. So nice to know it’s getting easier around here, but sad to know he is growing so quick! This past weekend the poor child has had a stomach bug that has knocked him out. Even still, I heard him tell Cash today “Cashy, You have to be quiet! Mom is sleeping!” He knew how exhausted I was from both of them being up several times last night. Then, he made a bowl of cereal for himself for the first time ever-without me knowing. He was so proud to tell me he did it himself! Then when we were standing in the kitchen, Cash wanted a bowl, and Ford said ” Mom, I can do it for you. So you don’t have to.” Sweet, sick angel child. “Ok-go for it.” He climbed up on the counter to get a bowl, reached in the fridge for the gallon on milk, and poured that bowl of cereal like it was for the first place trophy in the counter-climbing olympics. Later, he came into my room and it sounded like I was about to get a multi-million Dollar business proposal thrown at me. “Mom, I would like for you to please show me how to make my own hot chocolate.” Hands folded, Eyes big. Wow. What a way to ask! “That’s ok bud. I can do it for you.” “I want you to show me.” So off we went to the Keurig! He learned, and I am sure this is just the beginning of this independence. Cereal and hot chocolate. Cereal and hot chocolate made me realize my kid’s growing independence. Now while this may not seem so huge to you all, it’s crazy hard on this mama to think the boy who made her a mommy, this tiny infant who needed me every waking second, is now wanting to help her.When did the tables turn? His teacher is right. He is phenomenal. Through and through. And tonight I just felt the need to acknowledge it. And I know, all kids are amazing. We all think are kids are phenomenal. But truly, embrace the little tidbits about them that make them phenomenal! Prove it-talk to others about it. I feel like we all want to shy back from telling the great things about our kids in order not to step on any toes, but let’s share their strengths instead! Now friends, your turn–tell me what makes your kid awesome. What are their strengths? What do they say that makes you melt? How do they show their growing independence? Let me know in the comments! 9 years. Married 9 years. Is that even possible? No way-not possible. Not this couple. We are still hip and totally cool newlyweds just living the life. Ahh crap. I’m pretty sure saying “hip and totally cool” just instantly made us lame. Yeah-sorry Dale. You get included in my lameness. We’re “one flesh” remember? Thank the Bible for that one. But really, thinking back today, I started to wonder-what makes a “good marriage” per say? I feel like the saying “good marriage” is pretty relative, as everyone’s perception will be significantly different. But I am not talking about the storybook marriage with the carriage and perfect hair and engagements caught on film. I’m talking- “waking up to morning breath and trotting around the house in yoga pants and no bra” marriage. The messy, beautiful, every day life marriage. “Respect your Mate..blah blah blah.. I already know that stuff.” Ok yes, you have heard it 100 times over, but it’s true. If you don’t respect your mate, every argument will ultimately turn into a battle of who is better. Who is stronger-minded. Who is stronger-WILLED. None of these are a good thing. When she said that, I remember thinking that was a jab at us. ( I was 18 OK? Cut me some slack.) But as time went on, that comment stuck with me. I realized she was right. If you don’t marry someone smarter than you-it would be so difficult to respect that person. How can you talk about the serious parts of life with someone you think is an idiot? How can you take their ideas seriously if you think they are doomed to failure? He is kind hearted and I have learned so much from his generosity! He has always had a sound mind when it comes to money and has kept us afloat even in the harder times! He is spiritually minded and I can’t explain in words how grateful I am for such a wonderful family head. He is the dream! So when looking for your mate, look for the one who will make you better. Look for the one you RESPECT as a person first. And make sure he/she respects you the same! Wow. Now that was a concept. We both ALWAYS have to be giving 100%. Now when you are babies and in love, you think this will be easy! But when times get a little rougher, giving 100% of each other gets hard. So start early-and keep it up! Men-stay romantic. Ladies-dress up every once in a while. Keep it fun! And on the days when one can’t give 100%, you are prepared to step in and help them! Remember, we need to walk shoulder to shoulder–because when you are toe to toe, no one gets anywhere! This one is so important! I always feel closest to my hubbs when I hear him pray. To hear your mate speak genuinely from the heart is moving! And to hear them pray in someone else’s behalf melts your heart. Study the Bible together and things seem to fall into place. Learn to disagree-not to argue. When we were first married, if we had disagreements, I wanted to “argue” in the form of not talking. This DOES NOT WORK. Ok? Doesn’t work. Now you know-don’t do it. I have learned over the years, I don’t have to agree with him. I just have to disagree in an agreeable way. And this is still rough! Marriage is a learning experience, and we will never master it, but that is ok. As long as we are continuing to try! 5. Don’t talk bad about your mate. k y’all, this is huge. If you are finding you are bad-mouthing your mate with other people-you need to sever those ties. It is so toxic for your relationship! Surround yourself with others who build up their mates–not the opposite. I used to hang out with a friend who constantly downed her husband–then realized it was making me look for the bad in mine-like I had to say something bad about Dale to make her feel better about her marriage. It can’t work that way. Look for the good in your mate and share it with others. Once they develop a bad view of them, they can’t change it, while we will love our mate no matter what! So try your best to keep the positive attitude in the forefront- your marriage will be better for it! Talk with older ones. See what they have done to keep things lively. Ask what makes them tick. Try to emulate their successes-but *WARNING* never compare your marriage to anyone else’s! I think comparison is what kills a lot of couples. We live in a time where everyone posts the amazing moments (because obviously, who wants to post the bad) and it seems like everyone is living a fairy tale. Let me tell you–their husbands aren’t perfect. They argue. They aren’t living a fairy tale. This got to me for a while. My husband doesn’t buy me purses. He doesn’t come home with new diamonds for me every month. He actually doesn’t like to buy me THINGS at all. (Anniversary time is the exception.) So sometimes seeing everyone with their new bags and earrings and apple watches and what-not made me feel like I was missing out. This is the furthest thing from true. So learn from others-don’t compare. Look for all the sweet little things your hubbs/wifey does for you and be thankful for the little things that he or she put some serious THOUGHT into. Those are the things that matter. 7. Don’t put marriage on hold to raise the kids. Do me a favor-gross your kids out. Kiss and snuggle in front of them. Let them know you genuinely care for and LOVE each other. I always say ” We are a couple first-THEN we are parents.” If the couple dynamic doesn’t work, the parenting dynamic won’t work. So cuddle, squeeze, kiss and snuggle- these have been so important for us! My husband is fantastic at saying he is sorry….I am not the greatest at this. It’s hard. Your pride hurts. But when it’s all over and you have admitted your aren’t perfect-life gets a little sweeter and the next apology gets a little easier. And believe me, there will always be a next apology. 9. Stop trying to change your spouse. This happens all too often-Man marries woman. Woman is embarrassed by man. Woman tries to alter man. Man feels defeated. (Or vice versa.) How devastating! As if this world isn’t full of enough crap to make us insecure-add in our mate trying to change who we are? That’s soul crushing. So let’s try to keep the one we married-the one we married. That’s who we fell in love with after all! Overuse it. Kill em with it. Wear it out. We get made fun of for how often we kiss before we leave each other. How on the phone we ALWAYS say ” I love you.” Not just “luh-ya bye.” We make it count. We say it in the morning, at night, in texts throughout the day-nonstop. And it still means so much! To get that ” I love you babe” message during the work day still melts me. Don’t feel like if you over say it, it loses meaning. This is one of those things that has to be said to make a relationship work! So there it is dolls—just a few of the little things that have worked for us over the years. And again-no pro here. I really don’t think “the pro’s” exist. Really though, in 9 years, we have learned so much-and I can’t imagine how much more we will learn in the next 10, 20, 30+. What would you all add to this list? What is your go-to advice? Let’s hear it! Ok, I know I know. I said I would post this a while back–but sometimes I get so excited about sharing with you all, I put certain things on the back burner!!!!! Shame on me, because these products need to be shared with everyone-they are fabulous! No small talk today-let’s get right to it. Check out all the mess it corrects above….. That’s a win in my book! Click Here for some more info! You can’t argue with those benefits–I’m telling you -it’s worth it! Click Here to purchase! Ok-so this may be my holy grail of makeup products. If you follow me on Instagram, you have already seen my sing the “butter bronzer praises”. Ladies…It’s time for you to hop on the train. It’s a ‘universal bronzer’ in that it looks amazing on all skin tones–and that is HARD TO FIND. And girls, the smell. It smells like the beach. Or heaven. Or the beach. I can’t quite peg it, but I’m telling you-you need this in your makeup bag….Like–Yesterday. It delivers a tropical glow and was voted by People as a top bronzer! I’m telling you-you HAVE to have this! Click Here to shop! Easy Peasy!!!! So there you have it! My compilation of PF makeup you NEED to have! While I am a huge believer in using all different brands, this is one of those I hope to have more of as time goes on. Do you like PF? Do you think you will use these? Make sure to click the links and read more on them to see if this brand is for you!!! Guys, I am NOT a cook. But I Love food–and I love EASY recipes. (Also -have the hardest time spelling ‘recipes’ for some reason) This meal was so easy and so so yummy! I got the recipe from This website and she has an amazing website you should check out! I found her on Pinterest and she did NOT disappoint. Its called Life in the Lofthouse. CHeck it out! In the meantime, check this recipe out. 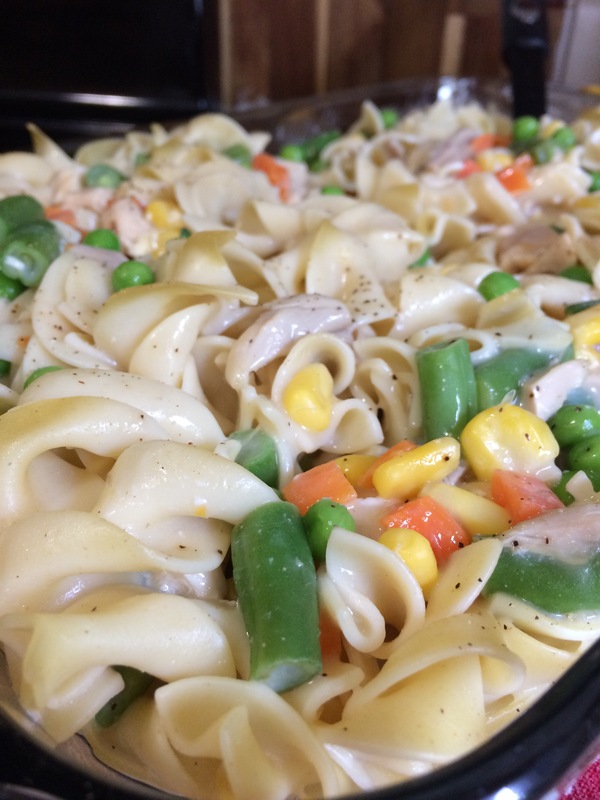 I cooked a while chicken ahead of time and just pulled it off the bone and stored i the fridge for the week…and used some of that for this casserole! So if you have to cook your chicken, it will take a while longer–but if you have. Chicken pre-made, this is a 5 minute prep! Preheat oven to 350 degrees. 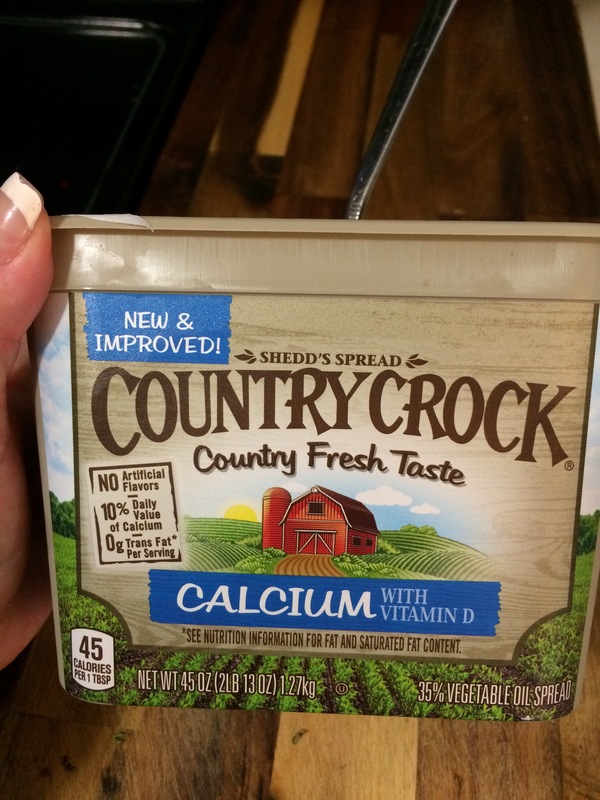 Smear your 13X9 inch pan with your Country crock butter. Cook the egg noodles according to the directions on the bag. While those cook, combine veggies, butter, milk, cream of chicken, cream of mushroom, salt/pepper, and garlic powder. Im telling you, it was so easy!!! Check out Life in the lofthouse website for more in depth directions if you like. I also tweaked the recipe a bit –because–butter. All the butter. Check out my fav here.. SO simple. SO yummy! Again, check out her website Here for more details!!!! I never have really thought of myself as any type of decorator, and really I am NOT. But I’ve noticed some say they love the little touches in our home! And after doing some research ( and by that, I mean strolling my house, looking for ‘touches’) I realized, those friends are exactly right! It’s the little ‘touches’ that make a house a home. And not anything fancy, or being perfectly put-together, because we are definitely NOT, but just the little things that make us happy and feel a little more connected! “Let’s start at the very beginning. A very good place to start” Ok sorry, Julie is ringing in my head now…But really-the front area when you come in our house is a favorite! My husband made us a simple coat rack, that happens to house about 50 coats and 12 bags at all times. Beside the point. Also, notice the sweet key my hubby surprised me with..It has our initials carved in each end-How cute is that??? 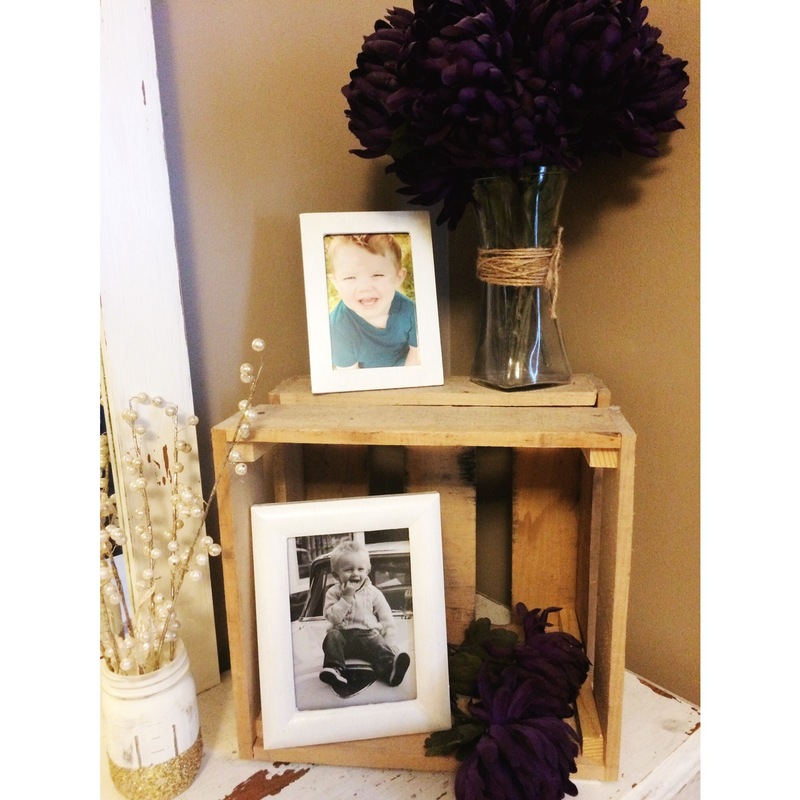 Notice too, precious pictures of our littles to warm up the space. Here is a “real life pic” with some of our coats and bags. Also-slightly grainy-please forgive me. Ok, Now scroll on past that one, and lets talk photos. You noticed the picture on my first blog post?? To say I am TOTALLY SMITTEN with that picture is an understatement. It was taken by a local photographer here in good old Knoxville, TN. Her name is Hayley Harper and she does amazing work! Click here for her website. Hit her up with any photo needs, and she will hook you up! As time goes on, I will post some more of her amazing pictures-but for now-my favorite! I cant stress it enough y’all- get family pictures taken. And when you do- print them! How often do we get pictures taken (or if we are fortunate enough, actually take a decent one ourselves) and then don’t print it! It’s stuck on our phone somewhere–heaven forbid it be in the cloud–and no one ever gets to enjoy it? So go now. See Hayley. Get Photos. Print them. What I was getting at, this frame-inside-of-a-frame thing….So fun! And another little touch that makes my house a home! The next area, is a spot on my dresser -reserved for the wild boys+dainties. I know-serious contradiction but something has to balance the crazies out 😉 The hubbs built me this crate, I fell in love, and had to use it in our room. Thus, the dainty+wild boy corner. Another fun touch. From here on out you should probably know–I am obsessed with this husband of mine. He builds things, he fixes things, he has a heart of gold, he adores my grandparents, he is a true best friend –really I could go on, and at some point I will–but for now, let’s leave it at “He is THE GREATEST.” So look throughout the blog for some fun nicknames “Hubbs, hubby, hunk, the man, the handy man, the hot one,” etc throughout the blog. Just embrace it y’all. Its going to happen. Ok back to the post. This is my mug rack. It is my baby. I am obsessed. I love it. I love it. I LOVE IT. Hubbs made me this one day in the middle of a personal dilemma. 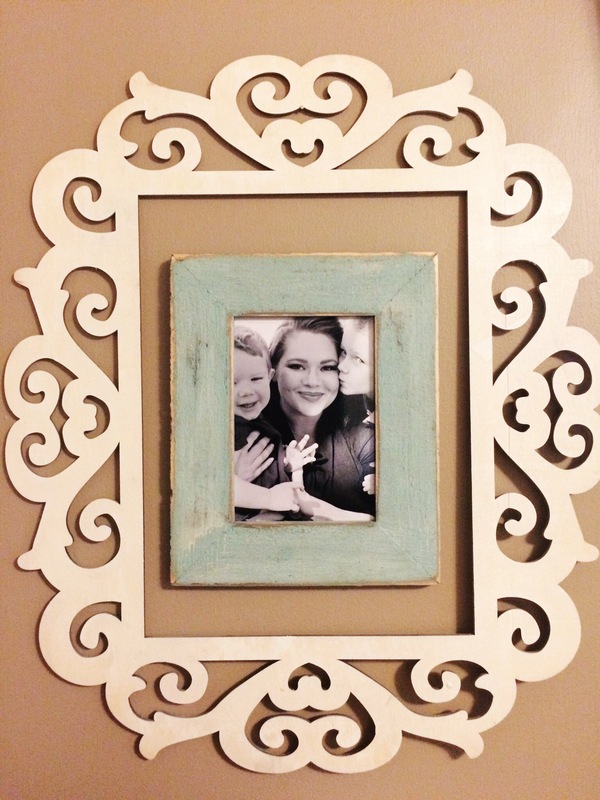 Here was the thought process…” I love this frame/board and want to hang it here. 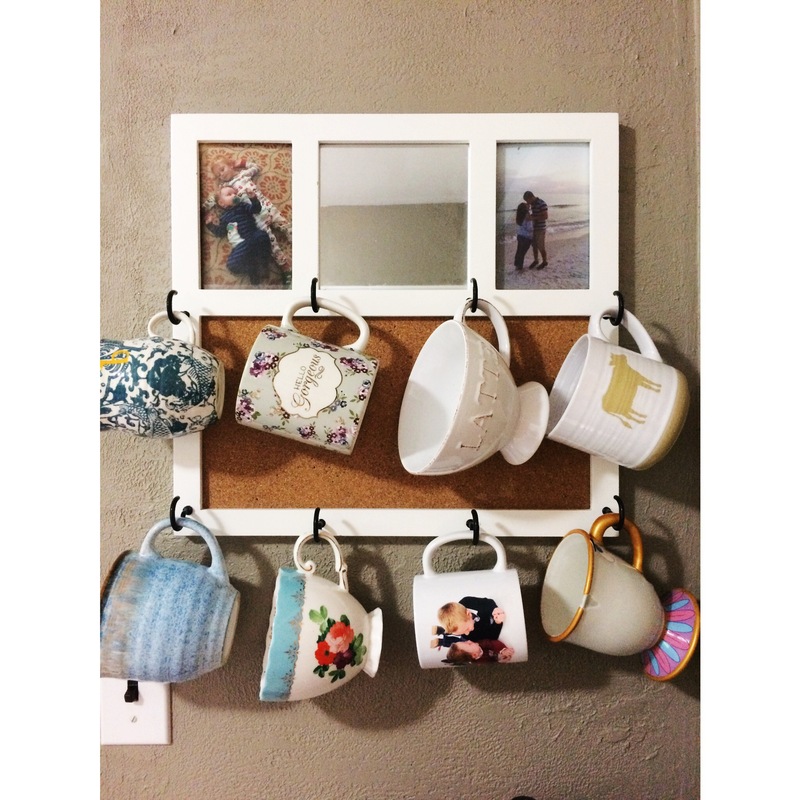 But I really need a mug rack over the coffee nook. What should I do?” Que the handyman. 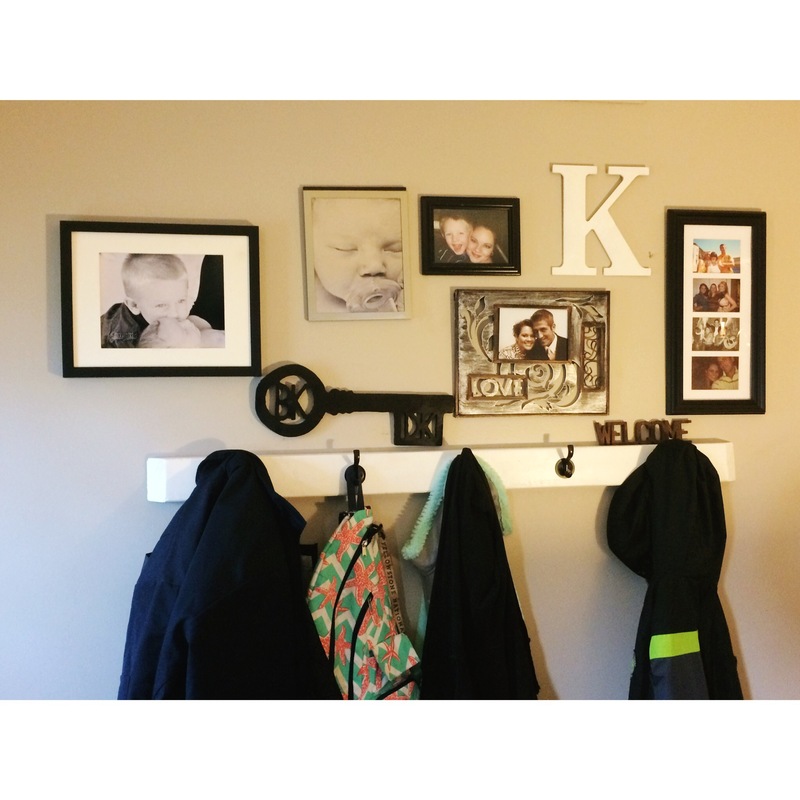 “Why don’t I just make a mug rack out of the frame? !” Umm.. yes. How about you do that? A short time later and I have this amazing rack that serves as such a conversation piece over coffee with friends! Thank goodness for the hunk with a brain. Can you guess which is my favorite? Oh my gosh-where to begin?? So here we are! My name is Brandi Kuch (pronounced “Cook”). I’m married with two wild boys, Ford and Cash. I’m sure you will see the term “wild boys” throughout the rest of my posts, but know it’s really a term of endearment. ‘Wild’ in the fact that the keep mama bear on her toes and well-they’re boys!